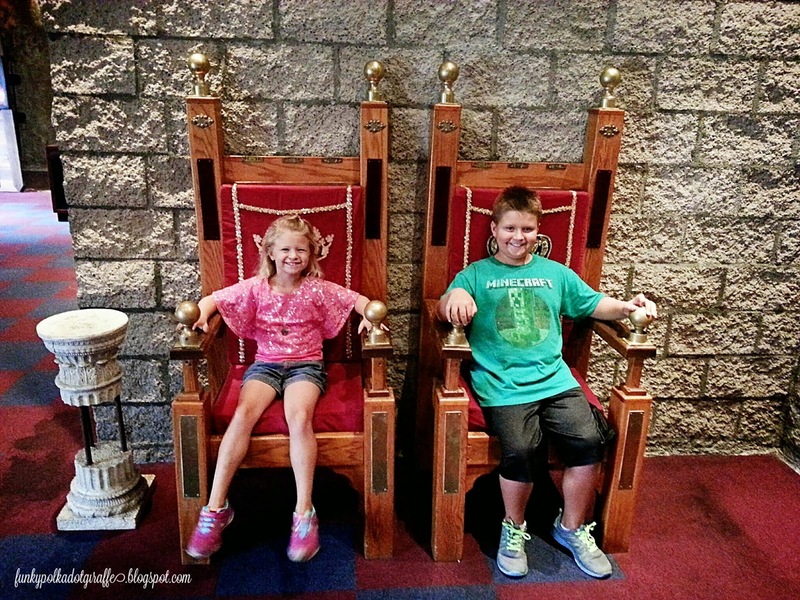 The kids and I had the extreme fortune to attend a behind the scenes tour of Medieval Times in Buena Park. We've been to Medieval Times before, but this was an even more amazing experience because we were able to tour the castle before the other guests arrived, and we toured the stables where the horses board and see the knights practice. 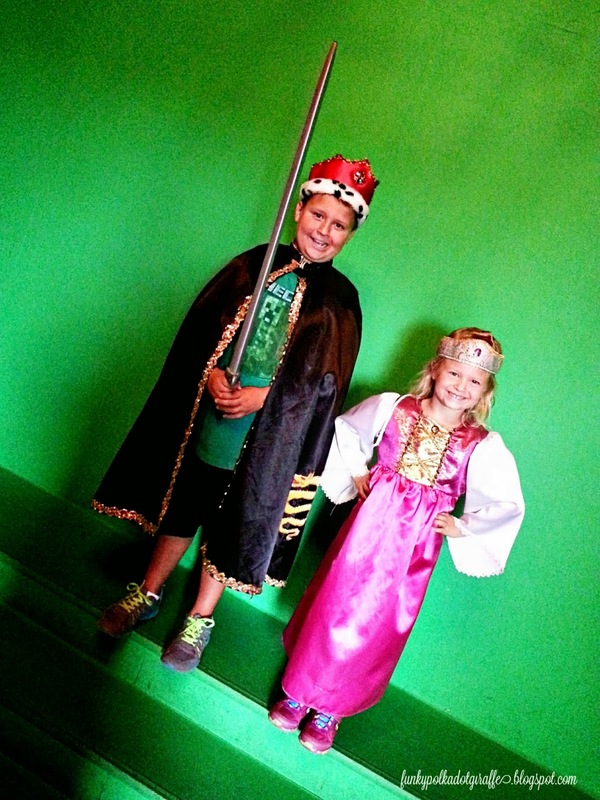 Since the castle was quiet and waiting for guests to arrive for the show, the kids played dress up in front of the green screen in the photo room. For a fee you can dress up like a noble and have your photo taken in a royal scene. After we were done playing dress up, we headed to the stables to meet the horses and Redha, the head horse trainer. 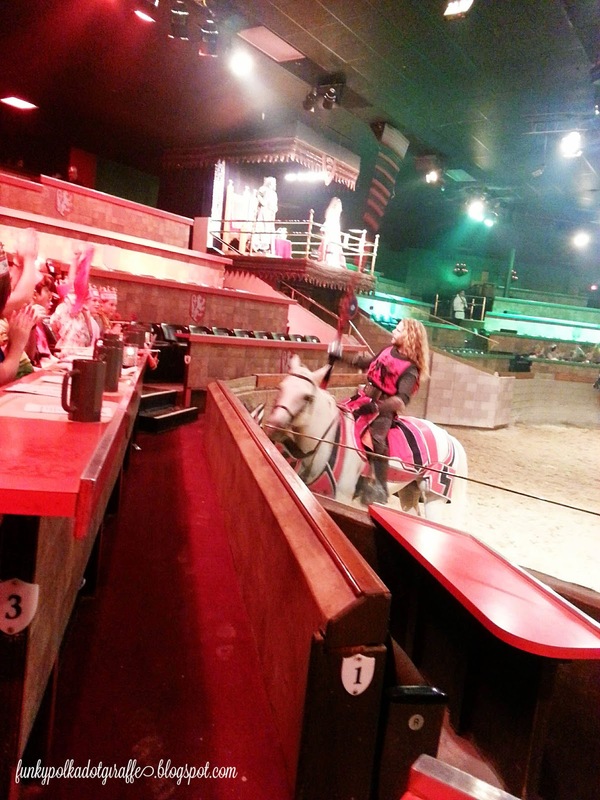 The horses are bread and training begins at the Medieval Times' Chapel Creek Ranch in Sanger, Texas. At age three, the horses are sent to one of the nine North American castles. 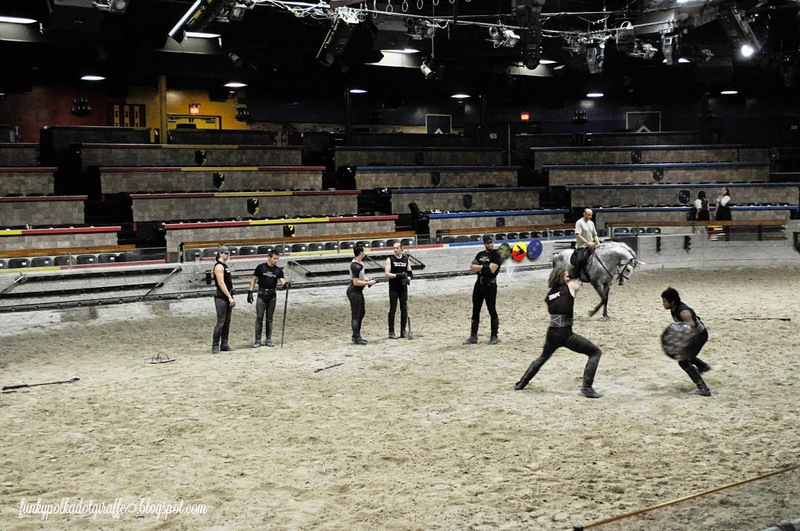 There the training continues and the horses become true entertainers, alongside the knights. 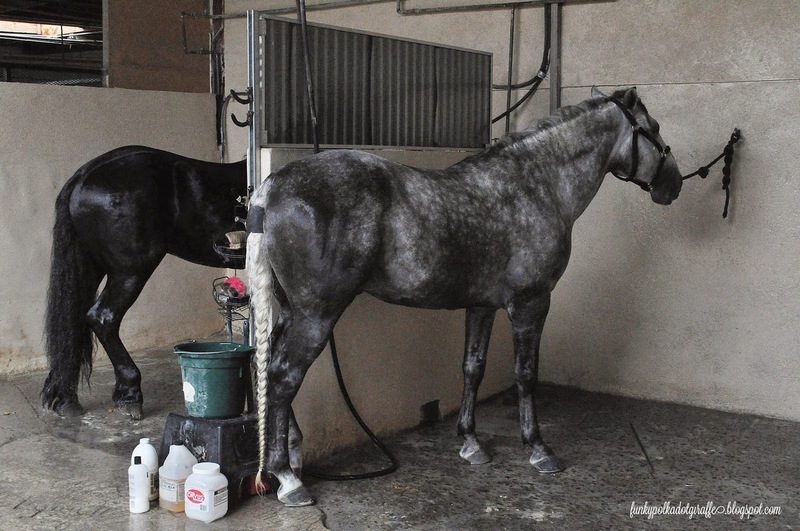 The horses live in beautiful stables inside the castle and they are washed and prepped before each show. The beautiful Andalusians - purebred Spanish horses with a Medieval heritage - start a beautiful gray - almost silver color when they are young. Then, as they age, they become the gorgeous white color they are know for. 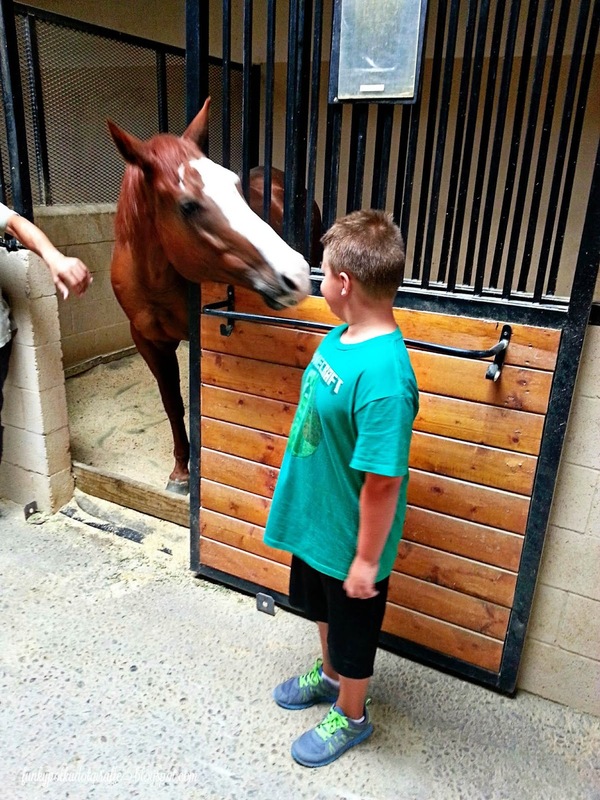 JT loved meeting the horses and having the opportunity to pet and talk with them. 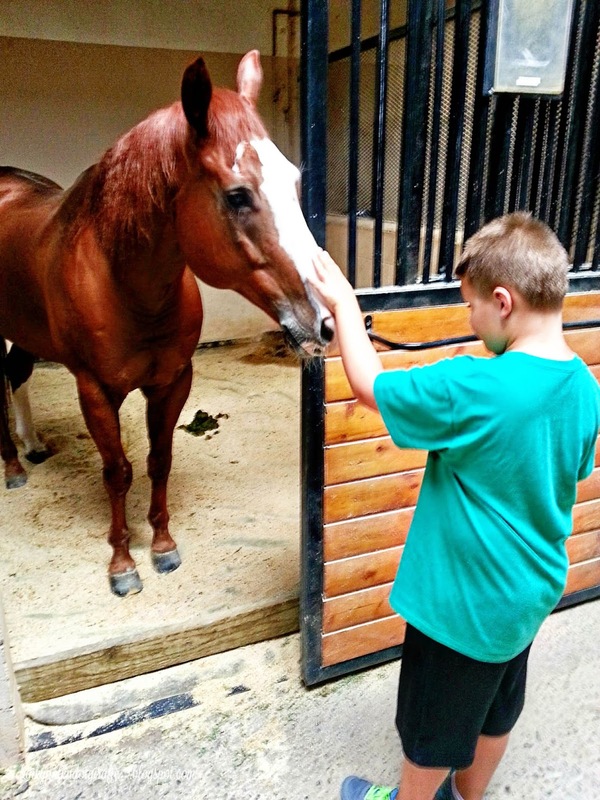 I enjoyed talking with Redha about how the horses are trained and loved. They start their lives on the ranch in Texas, perform and bond with the knights/riders/trainers, and then when their performing career is over, they get to return to the ranch and live out their lives receiving royal treatment. 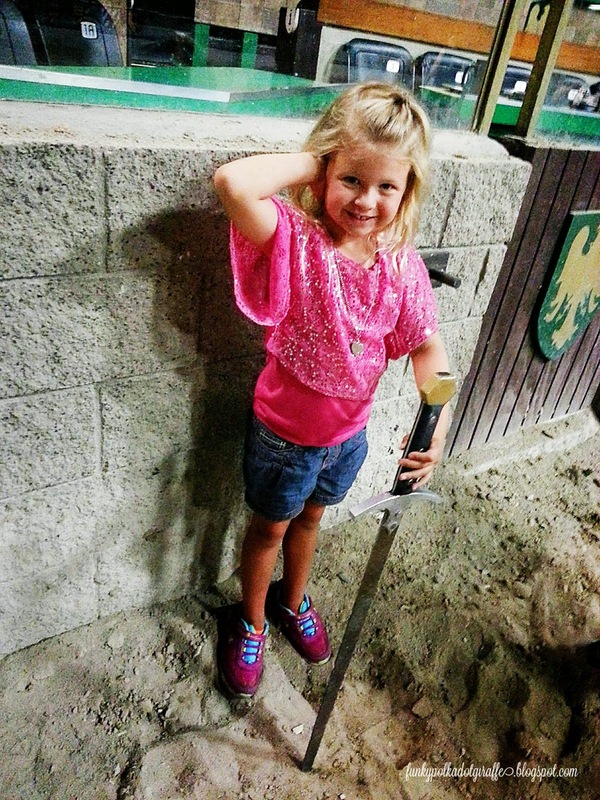 After we were done meeting the horses, we headed backstage to see where the knights and horses get ready for the show. They take care of the weapons, workout, organize the armor and gear, and keep the horses that are performing in the next show. 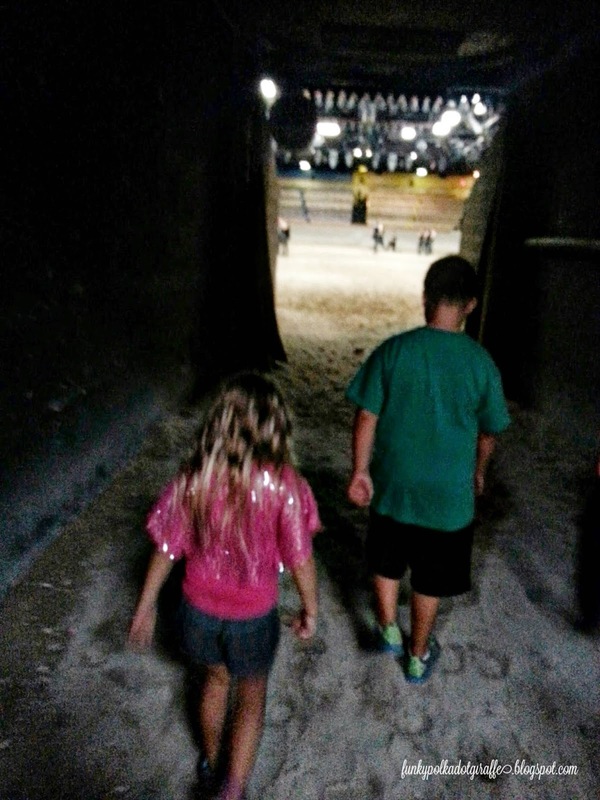 Next we headed out the tunnel where the knight and horses go in and out to the arena. It was fun to follow behind the kids and see their reactions as they entered out onto the arena floor where the knights were practicing. bonding or riding the horses, or maybe working out to keep fit. Jesse says when he looks to hire a new knight, he wants someone with an athletic background because the job is physically taxing. The weapons are no joke! They are real and heavy! 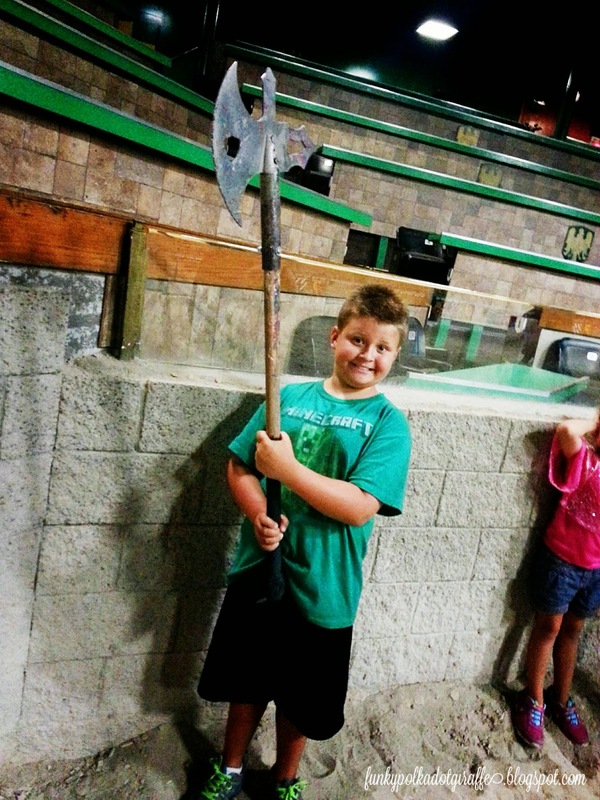 The kids loved having the chance to handle the weapons and find out how they are used. Jesse said that knights start as squires and once they've proven themselves during training are able to advance to be a knight - just like in Medieval times! The training looked intense and it was loud! They are heaving heavy weapons and protecting themselves with equally heavy shields. And the sparks you see when the weapons collide? 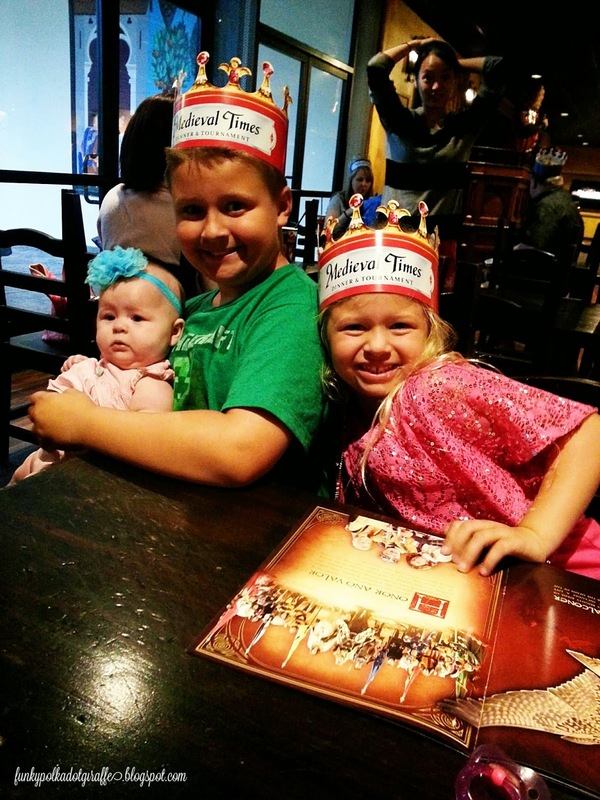 The kids enjoyed watching the knights. Even Grace had fun see what goes on before all the guests arrive. I was amazed at how much preparation and time is poured into the show. Jesse said that they are the only live show of their kind and that a lot of different shows have come and gone, but almost 30 years later, the Buena Park castle is still providing amazing entertainment to its visitors. After our amazing behind the scenes tour concluded, we headed to the Hall of Arms to wait with the other guests for the show to begin. Before the show begins you can grab a drink from the bar, see the beautiful horses in the viewing area, purchase Medieval merchandise or for $2 tour the Museum of Torture. 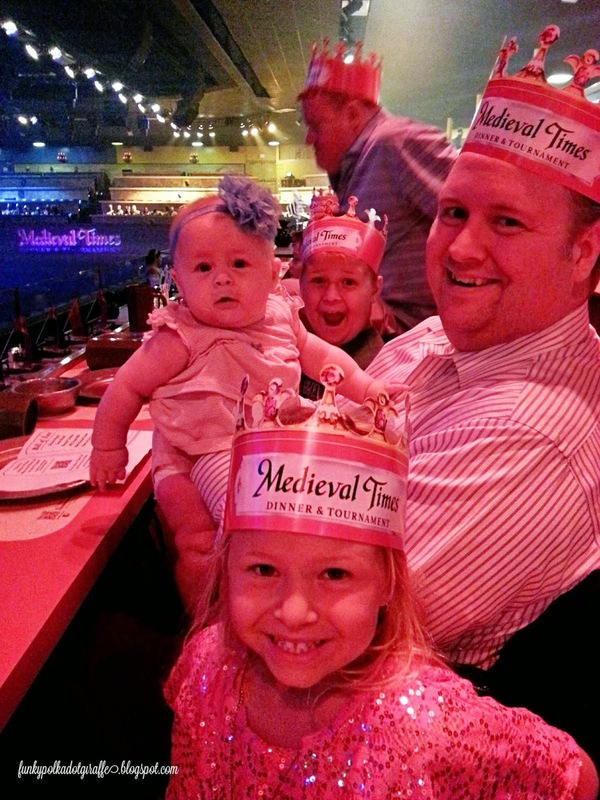 During this visit our family was cheering on the Red Knight!!! Each guest is assigned one of six knights to rally on to victory. 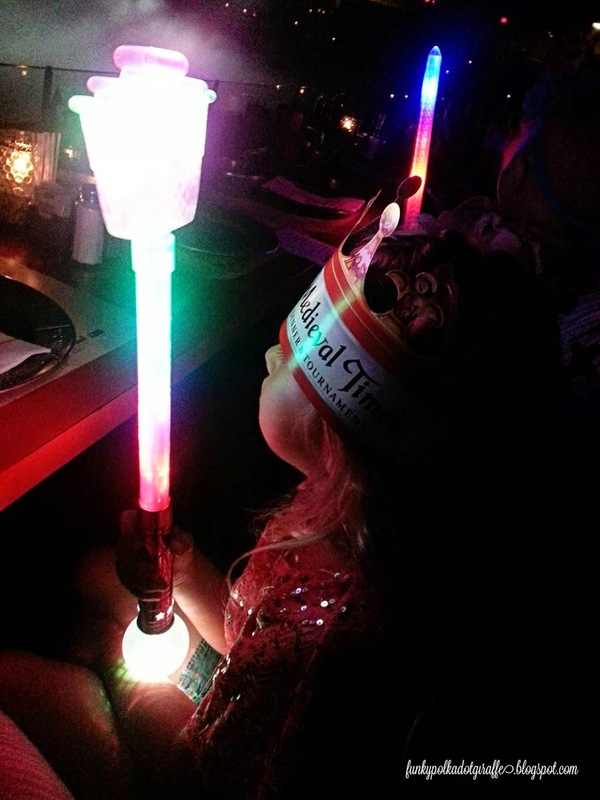 I love that the lights you sit under are the color of the knight that you'll be cheering for that evening. The kids were so excited for the show to start and for our knight to make his appearance. I was excited to watch the horses perform and to know that those weapons were no joke! 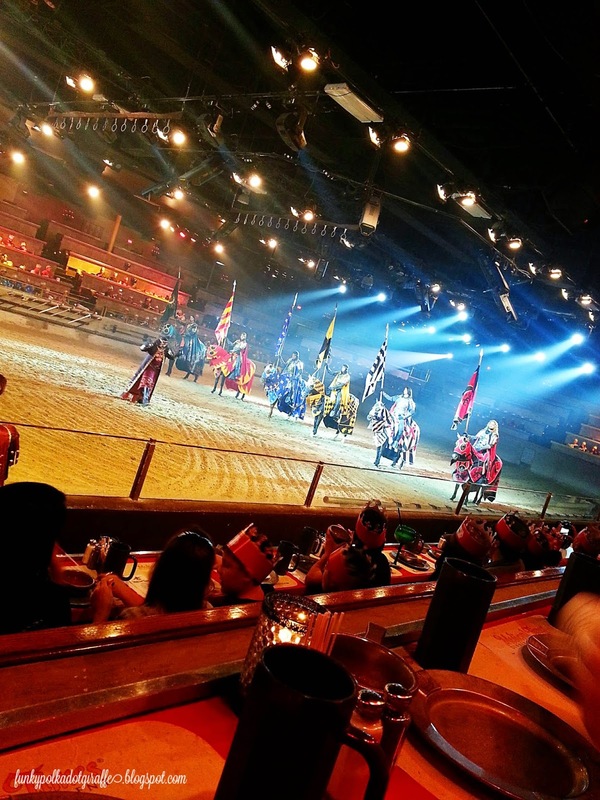 Medieval Times does an excellent job of creating an authentic ambiance that transports you back to when men were knights and crows rallied behind them. It really does take your breath away when the knights all present themselves to the king and ride in on those amazing horses. 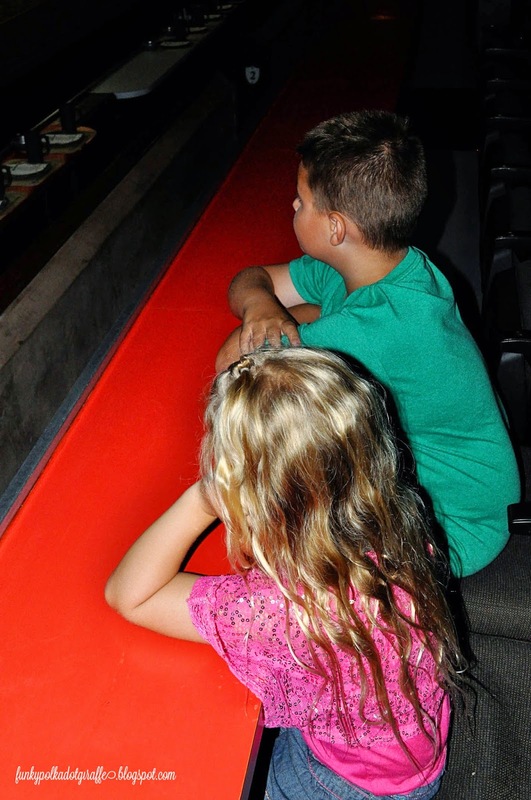 It was so fun to watch the kids sweet anticipation for the red knight's arrival. The bill of fare is delicious! And yes, you eat with your hands! Both of my kids think it is so cool to eat a baby dragon with their hands. Just kidding! 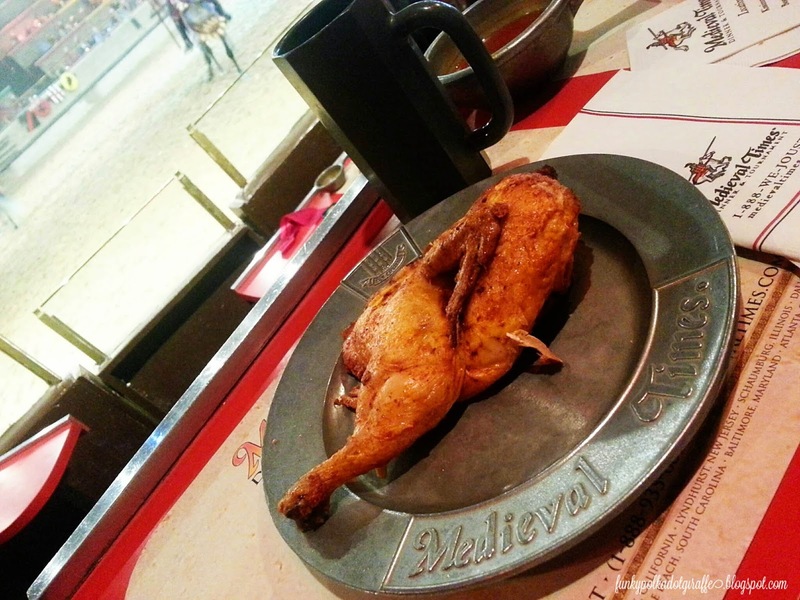 It's chicken, but our fun waiter (or serf) told the kids that baby dragon had been prepared just for them. My favorite part is the spare rib and garlic bread.